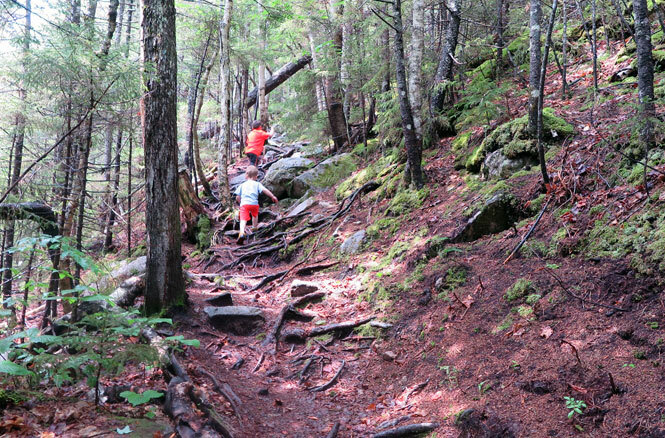 Since we’ve given the Arethusa Falls Trail hike the rating of “Family Hike,” you can draw the appropriate conclusion that it’s feasible for all ages; however, bear in mind that it is a hike in the White Mountains of New Hampshire. 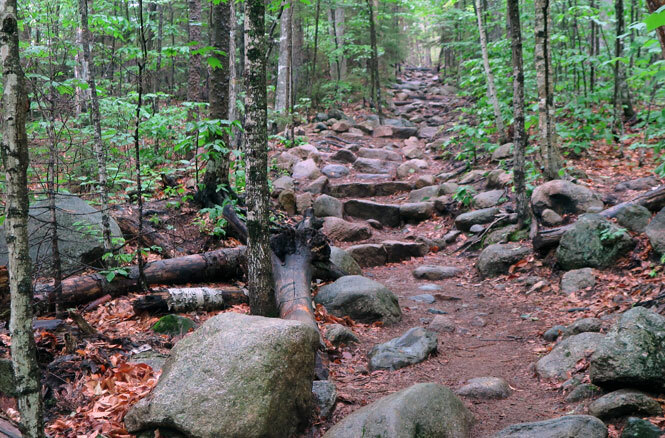 And by this I mean there are rocks, lots of them, along with gnarly tree roots throughout the trail, which climbs 900 feet over 1.5 miles. 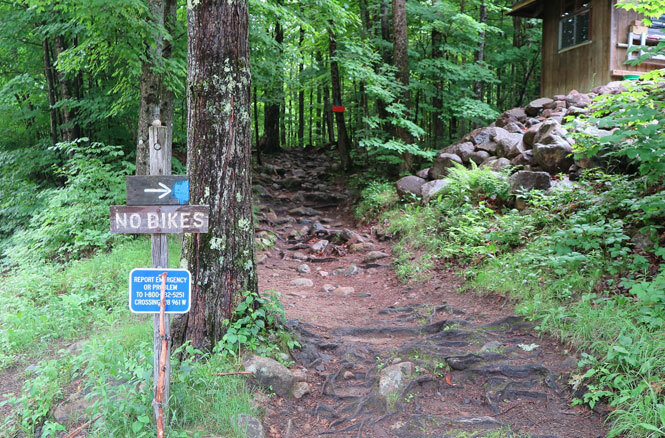 That might not sound like a lot, and if you’re an avid hiker, it isn’t. But…if you’re a tourist who doesn’t hike or exercise frequently, be prepared to sweat your heinie off. I don’t say this to scare you away; on the contrary, Arethusa Falls is magnificent and worth every ounce of sweat, just prepare appropriately. The hike begins at the end of Arethusa Falls Road; there is parking both at the beginning and end of this road. There’s a private residence at the end of the road, and the trailhead is accessed by crossing the train tracks and staying to the left of this property. The Arethusa Falls Trail begins on the left of the residence and follows blue blazes throughout. This image is indicative of what you’ll find throughout: a wide path with gradual to moderate climbing. 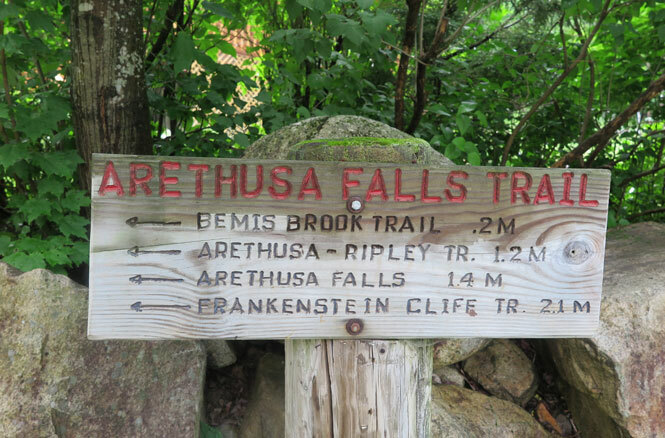 A mere 0.1 miles into the Arethusa Falls Trail, the Bemis Brook Trail cuts to the left, rejoining the main trail after 0.5 miles. 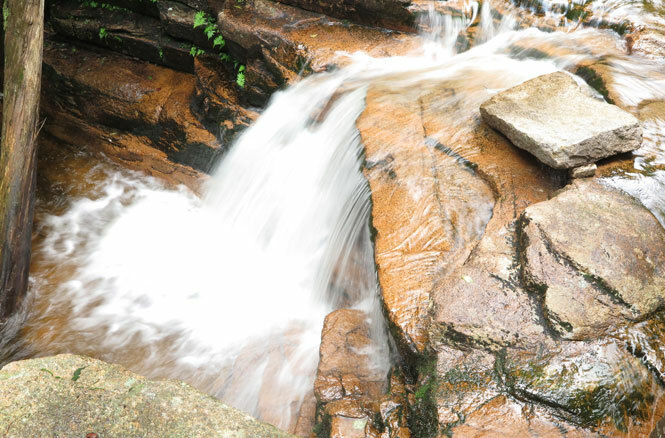 For the small price of some steeper climbing, the Bemis Brook Trail adds two more waterfalls to the hike. While the Arethusa Falls Trail stays atop the ridge, Bemis snakes alongside the brook below and thus has to climb the steep bank to rejoin the main trail. Given the ascent, it’s typically best to take this detour on the way in. 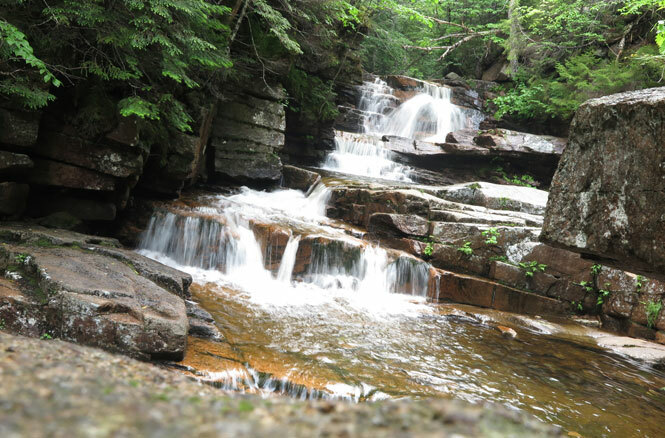 A look at Bemis Brook just above Fawn Pool, which is accessed via a short spur from the Bemis Brook Trail. 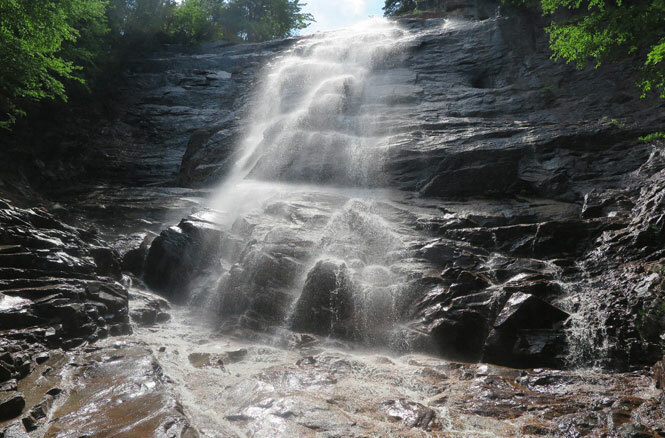 Bemis Brook Falls serves as the opening act. It also helps keep kids interested in the hike. Or it distracts them from continuing. A risk you just have to take. Overall, the Bemis trail is narrower with more roots to compromise footing. That said, my three (almost four)-year-old managed fine with some assistance. 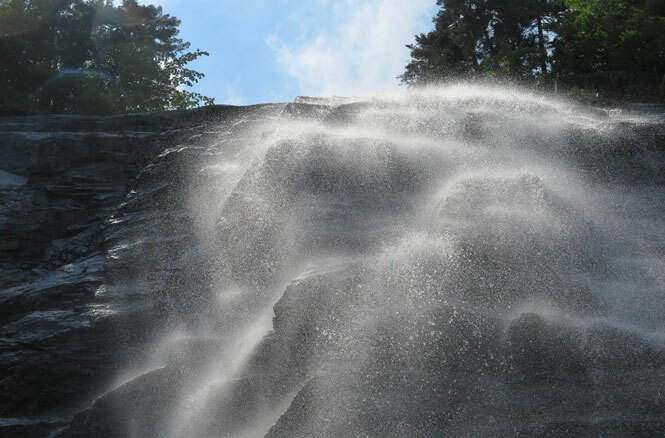 Coliseum Falls, the second cascade on the Bemis Brook Trail, is a multi-tiered showcase. Looking down at the top tier of Coliseum Falls. 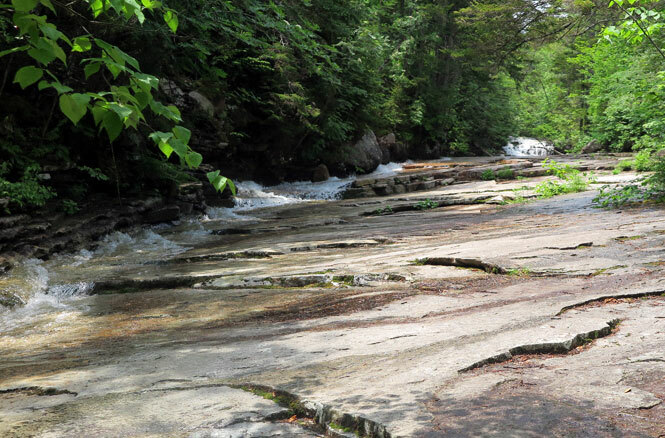 After Coliseum Falls, the Bemis Brook Trail climbs the steep bank to Arethusa Falls Trail. Bemis has 400 feet of elevation gain, and most of it is in this ascent. My three year old was able to tackle this section with some spotting and a few quick lifts. Back on the Arethusa Falls Trail, which gets its girth by following old woods roads. 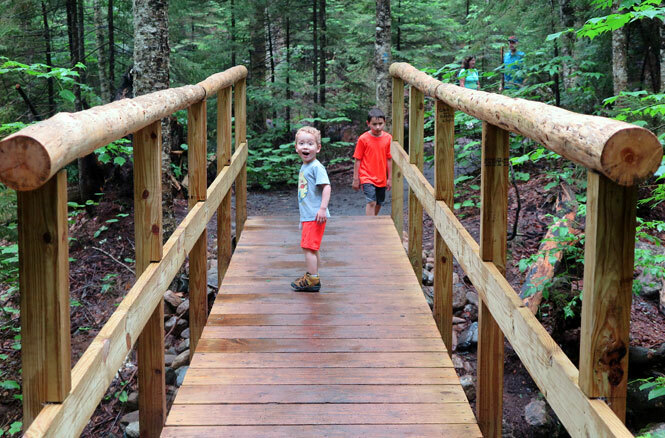 The Arethusa Falls Trail has two bridges that help add entertainment for younger children. Just make sure they watch out for the troll. 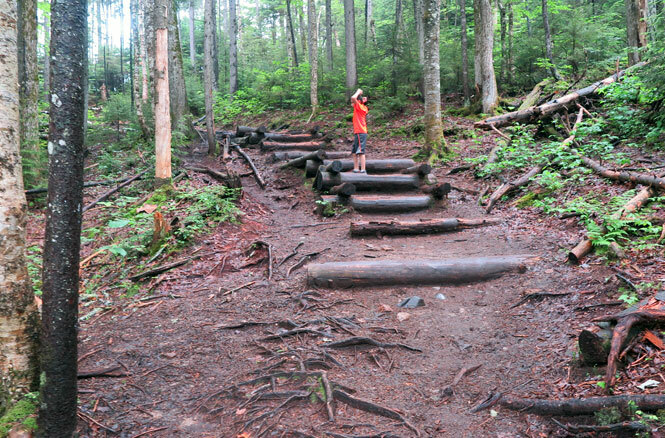 Toward the end of the trail, there are also a couple of areas with log steps. 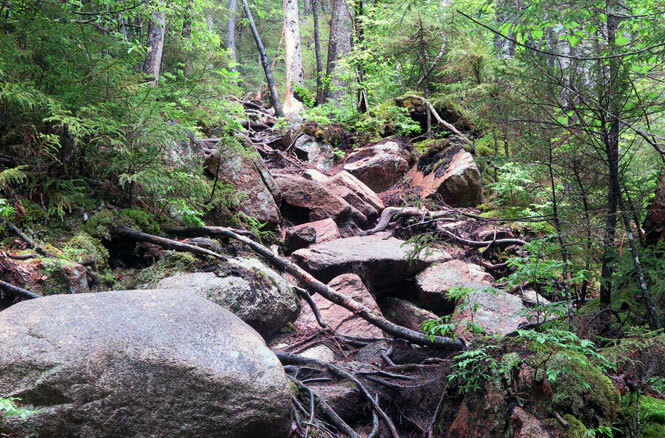 Shown here is the last climb before the trail dips back down to Bemis Brook and Arethusa Falls. 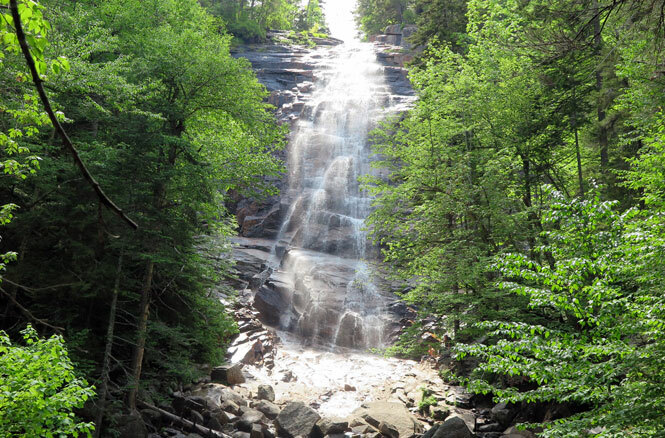 The first glimpse of Arethusa Falls from a distance. With a little care, hikers can get to the base of the falls. 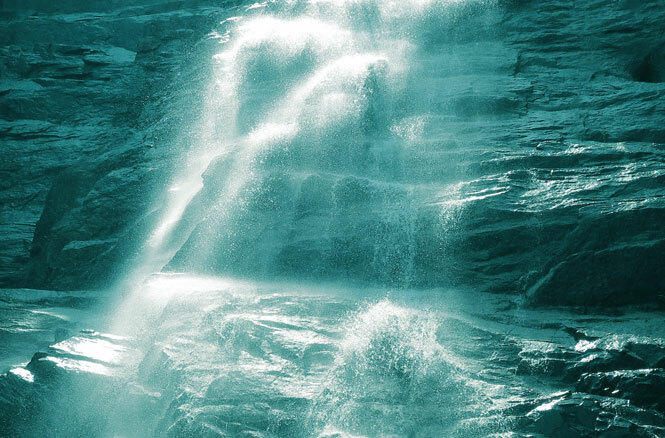 From the base of Arethusa Falls, the cascade appears to be pouring out of the sky. 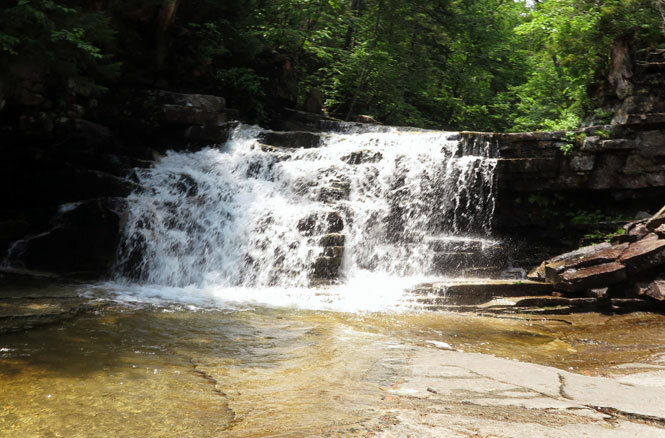 We visited Arethusa Falls in late June, and the flowage was impressive. I’ve seen pictures from people who visited at the end of summer when the water was barely trickling over the cliff, so plan your trip appropriately. 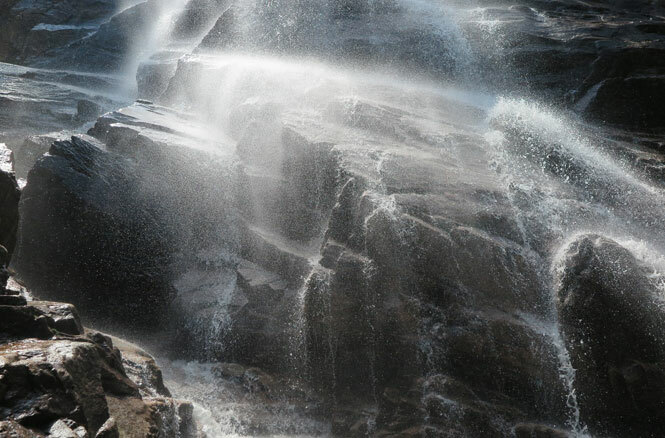 The spray coming off the falls also made the surrounding rocks slippery, so watch your step if you’re going for the up-close experience. Another shot playing around with the camera.